Never-ending ‘to-do’ lists, Christmas shopping bazaars, constant watch for promotions and discount fairs, heavy shopping bags, lighter wallet, end-of-school Christmas parties, Christmas drinks, tired feet, sleepless nights – yes we are only about two weeks away from Christmas! Well, the parties and drinks might continue upto the New Year but the good news is that the crazy shopping period ends soon. By the end of this week the crowd at the designer boutiques, department stores and the famous Hong Kong street markets would find its way to another place – the Hong Kong airport. I can already visualise the scene – harrowed young mums trying to calm screaming babies or overly excited toddlers, sleep-deprived dads –too much partying you see arguing with the check-in staff about the extra luggage. ”But this isn’t even ours”, they argue, pointing to an extra-large size suitcase filled with gifts for family back home, “Atleast the contents aren’t!” Then there are the unaccompanied young travelers – 8 and 10 year olds who are probably travelling all by themselves for the very time, excited yet nervous, seemingly unaware of the chaos around, and then there are families like mine with grown up kids, 6 and 10, perfectly capable of handling themselves and helping us too and yet young enough to listen to us and give us a cuddle if need be. You might see the likes of us sauntering around the duty-free shops or having a relaxed cup of coffee while waiting for the plane to depart, Oh the wonderful air of Christmas! I am on the bus back home and I can’t help giving frequent glances at the time showing on my mobile, 15:11, it says. The school bus comes by 15:25, so I hope I would be able to make it on time, just like I have been hoping and following the same stressful schedule these past two weeks! It’s work in the morning, I have started teaching by the way, then a mad rush to get on to a bus to go to the ‘planned’ shopping area. Running around the store trying to locate the gifts, run around a bit more trying to get the best deal available and then barely two hours later rush to find a bus back home, only after in a quick five-minute stop at the super market! Sometimes I wonder if it’s all worth the effort and the stress, sometimes I wish we were going to a remote island instead of going back home for Christmas. 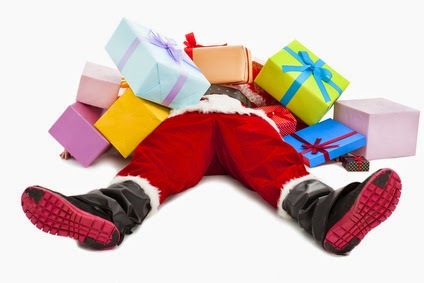 I was up last night until 2 am sorting the mad chaos of shopping and doing what I am really terrible at – gift wrapping! I am almost ready to reveal the magic of the ‘real’ Santa – the one that does all the hard work behind the scenes, hunting for presents, hiding the presents, hiding the special Santa gift wrap, writing their names with my left-hand so that they don’t get suspicious and giving the surprised look every Christmas morning, year after year, Phew! It’s getting harder and harder each year as they are getting smarter and smarter. Sometimes I think they already know but are keeping up with the farce just to keep me happy! A few more days to go before this madness ends, before I would be sitting snug under a cozy blanket, on that plane heading home, with a glass of wine in my hand, watching a Hindi drama on screen. It won’t be long before I meet my family and hand out the presents to those hands who have raised me, embrace those who have always put my needs before theirs, give a cuddle to the little monsters in the family that are multiplying by the dozen and watch their eyes open wide as they open Santa’s presents. Hmmm, maybe I can keep up with the farce a little bit longer. Endure a bit more retail therapy. It is certainly worth it!